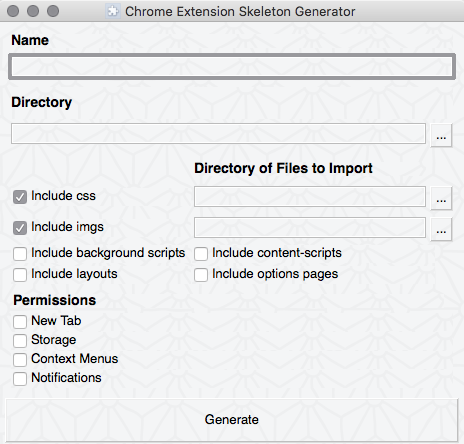 Chrome Extension Skeleton Generator (or cesgen) is a python utility designed to allow rapid prototyping of Chrome Extensions. Crafts a maintainable folder structure for development. Takes cares of permissions and script syntax in the manifest file. Copies over css/img directories into your projects. Creates background and content-scripts with options and context-menu code added. Quick creation of custom homepage extensions. Fixed some bugs with generating the manifest file. Fixed a bug where iterating through options wouldn't work on newer versions of Chrome. Streamlined the option retrieval boilerplate. Added support for generation of css-partnered content-script generation. Added visual feedback when generation is finally complete. Added support for icon generation and boiler code. Fixed a bug where blank spaces caused some weird unicode-rendering errors. Cleaned up the folder structure. Code and tutorials can be found here. The latest release can be found here. The code is licensed under the Apache License, which means you are free to modify it however you desire.